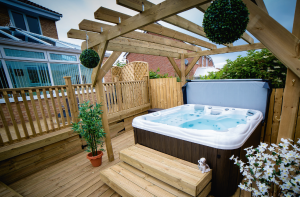 This award-winning hot tub installation gave the North Spas team the ideal opportunity to transform a domestic garden into a relaxing retreat for the property owners. The client initially visited the North Spas showroom in Birtley with no idea of what size of style of hot tub he wanted. After discussing the various options with the North Spas sales team and wet testing three different spas, he decided on the 748L from Artesian Spas South Seas range. The 748L boasts 48 stainless steel jets powered by two 2BHP pumps and the addition of full foam insulation helps to keep the water temperature tropical. The 748L has jets targeting the neck, shoulders, back, legs and even feet. Accounting for 65 per cent of total sales from the South Seas range so far this year customers are enjoying the neck jet feature and stunning LED system. The transformation of the garden was a carefully planned operation, which took the North Spas team nine days to complete. A 9.1m x 6.6m multi-level decking area was constructed using high grade pressure treated timber. Supported by a framework of C16 joists, North Spas are confident the decking will survive even the harshest weather conditions for 30 years. A 3m x 3m bespoke pergola was then constructed over the hot tub giving the customer the option to drape a fabric sail shade over for extra privacy or shelter. On completion, the client commented: “Thanks to Davy and his superb team of lads, who have transformed my garden with decking throughout and a fab hot tub. Great result and a great team of lads. Thank you all North Spas”. The project won Gold in the Residential Hot Tubs £7,000 – £14,000 category in the recent BISHTA awards.